The Super Distortion, the pickup that started it all. OK, maybe it wasn’t quite like this, but before Larry DiMarzio created the Super Distortion there was no after-market pickup industry. You typically bought a guitar, and just lived with the pickups it came with. But in 1972 the world changed. The Super Distortion was nothing like the traditional pickups found in most guitars. With a much higher output and a ceramic magnet, the Super Distortion was able to push the amplifiers of the time much harder, giving a player more sustain, and of course distortion. It became very popular with guitar players all over the world, and a new industry was born. OK, enough of the history lesson and cheesy paraphrased quotes. I tested the Super Distortion in my Ibanez 20th Anniversary RG550. It has a basswood body, and maple neck and fretboard, floating double locking Edge bridge, and the accompanying pickups are a DiMarzio made IBZ/USA single coil, much like a DiMarzio HS-2, and DiMarzio PAF Pro. Let’s get it out there right now. The Super Distortion IS the sound of Rock ‘N Roll. It is fat and rude, just like rock should be. The Super Distortion is heavy, mean, and very organic sounding. It’s fat and rude even on clean tones. Hit the strings hard and it barks at you. Play a little softer, and it’ll be a bit more friendly, but that’s no fun! The Super Distortion is at its best with dirty tones. The ceramic magnet helps give the Super Distortion an immediate attack, and the boosted lows and mids means that you are greeted with a glorious wall of sound. It is a harmonically rich pickup, and lends itself well to rhythm and lead playing. Your notes will never get shrill or harsh as you play further up the fretboard. In the seventies there weren’t really any two or three channel amplifiers around, so guitar players who preferred dirtier tones relied on the volume knob on the guitar for cleaner tones. The Super Distortion does a great job of cleaning up when the volume knob is rolled back. The pickup also responds quite well to picking dynamics. You can get a softer cleaner tone just by picking softer or using your fingers. The huge roaring wall of sound isn’t the only thing that the Super Distortion can do. Split it with the single coil in the middle and you’ll find some very nice strat-like tones and output. This setting could easily do some funk and country styles Add a little chorus and analogue delay and you’ve got those classic eighties clean tones. If you are playing classic or modern rock, hard rock, and less extreme metal styles the Super Distortion is for you. It probably isn’t quite tight enough for more modern aggressive styles of metal, but if you like it loud and proud, nasty and rude the Super Distortion is for you. Overall the DiMarzio Super Distortion is a classic pickup that is designed strictly to rock. It’s big fat organic tone can be heard all over so many albums from the last four decades, and if you like to play rock of any description it’s well worth having a guitar loaded with one somewhere in your arsenal. 3 Responses to "DiMarzio Super Distortion – review"
The Dimarzio Super. Great pickup. I find that on Strat scaled guitars the Dimarzio rocks. I think though that the Duncan Distortion is probably a little hotter it seems, or at least it sounds that way to me. I also like the treblee on the Duncan. Although, the Duncan doesn’t sound as good to me on a guitar with a Whammy. I find that the duncan is better or guitars with a hard tail or even better with Gibson LP scale guitars. Maybe it’s just me, but the Duncan has a really sweet sound with it’s distortion that isn’t as balls to the wall sounding as the Dimarzio, but it still is loud. The Distortion from Dimarzio has more of the Rhandy Rhoades tone to me. Now, that said, you have to try the Super 3 by Dimarzio for your bridge if you have a whammy bar on your guitar such as the Ibanez or a Strat. I had one in a Strat Heavy Metal which was Fenders answer to Ibanez and Kramer and Jackson guitars with pointy headstocks. It has a 25″ scale like the PRS, and with the Super 3 it just rocked. 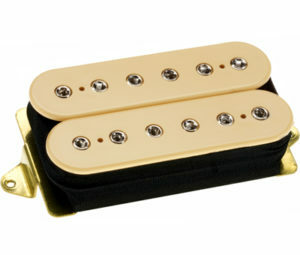 I think the Super 3 is even hotter than the standard Distortion from Dimarzio. But, it’s also darker sounding and great for guitars with Floyds or Edge trems. Try it, you’ll like it..
Hi Frank, realistically, all three of those pickups are great picks for the sorts of tones you want. Best thing to do would be to go and listen to as many demos as you can of the pickups mentioned and work out which one speaks to you the most. Personally I can’t decide between the Custom and EVH Frankie, so much so that I have both in different guitars.